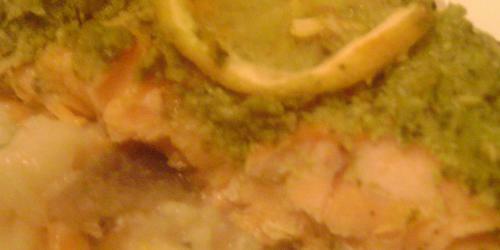 This dish was actually inspired by Kasey Fleisher’s Roasted Salmon with Pesto. It was my turn to host my book club and I knew I wanted to serve fish. I pored over her awesome site, eating/sf until I found this delicious salmon recipe. I tinkered with the pesto, adding fresh scallions, lemon zest and lemon juice and omitting the pine nuts and roasted the salmon with the pesto baked on, to mellow the garlic’s flavor. I served it over a bed of risotto with seared wax beans on the side. In a blender or food processor, combine all ingredients except salmon and puree until a thick pesto forms. Lay the fillets on a baking sheet or in a glass baking dish. Cover completely with a thick layer of the pesto and a slice of lemon and bake for 25-30 minutes or until cooked to desired done-ness. This was a fantastic dish!! The pesto was like nothing I’ve ever tasted- I loved the lemon twist! Two thumbs up for this dish. The pesto complimented the fish perfectly, delicious! I cooked this for my family along with that risotto you referenced. My dad thinks it’s the most gourmet dish ever made in the house and everyone loved it. I really liked your recommendation. I love pasta. Vegans will not get good pairings easily. I follow your blog to get a good dish idea, recipes, and health benefits. Next week I have organized a party at my place for my colleagues and I have decided to make everything vegan. So I wanted to arrange the vegan dishes with interesting combinations. I really liked this pasta with wine ideas. I will definitely include this in my menu. Thank you so much for your tips.